The Ramada Dubai is centrally located in the heart of Dubai's downtown commercial & financial district, close to World Trade Center and many sightseeing attractions. The Ramada Dubai features one hundred thirty five foot high stained glass mural - the largest in the world. This stunning piece of art can be viewed from the panoramic elevator leading to the hotel's guest rooms and suites. We invite you to browse through our site and hope you have an enjoyable experience. 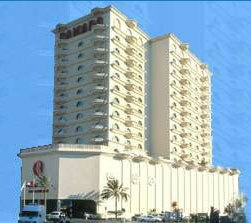 We look forward to welcoming you to the Ramada Hotel Dubai. 172 newly refurbished rooms in four categories - Premium, Business, Deluxe and Executive Suites, over 10 floors. All rooms are 50 sq. mts., feature unique split level interior, safe deposit box, high speed internet, IDD phones, Satellite TV, Mini bars and complimentary Tea/Coffee making facility. Many rooms have balconies. Non smoking rooms are available on request. Complimentary shuttle service from the airport is available for confirmed reservations.